Simon, Michael, and Lily are playing on a multiplayer server when a strange lightning storm hits their town. In the middle of an intense game, a bolt of lightning strikes, sucking the three friends into the game! They discover that they’ve been transformed into their Minecraft characters. They try to escape, but they are trapped in the Overworld! While battling other players and hostile mobs, Simon, Michael, and Lily try to find a way home. Just when they are ready to give up, their town is attacked and Simon’s Minecraft home is destroyed. The friends now have to find out who is terrorizing them, and if the same person is responsible for trapping them in the game. If the trio can find and defeat the evil villain, will they finally be able to make a home in their favorite game? 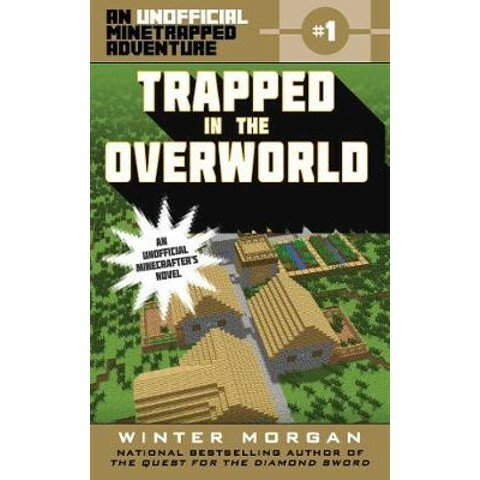 It’s a battle against an unknown enemy in this first installment of the new Unofficial Minetrapped Adventure series. Sky Pony Press, with our Good Books, Racehorse and Arcade imprints, is proud to publish a broad range of books for young readerspicture books for small children, chapter books, books for middle grade readers, and novels for young adults. Our list includes bestsellers for children who love to play Minecraft; stories told with LEGO bricks; books that teach lessons about tolerance, patience, and the environment, and much more.In particular, this adventure series is created especially for readers who love the fight of good vs. evil, magical academies like Hogwarts in the Harry Potter saga, and games like Minecraft, Terraria, and Pokemon GO. While not every title we publish becomes a New York Times bestseller or a national bestseller, we are committed to books on subjects that are sometimes overlooked and to authors whose work might not otherwise find a home.